Do you know what is long tail keywords? Are you aware of their importance in website SEO? There are so many articles out there talking about them. SEO experts says that you should focus more on long tail keywords to drive more traffic with better user intent. Is that true? YES, this is true. More than 60% of the queries searched on search engines are long tail keywords. Let’s discuss more about their importance in SEO. Keyword with more than 3 words in a single search term is called long tail keyword. For example- “increase website traffic” & “how to increase website traffic” are two keywords where latter one is a long tail keyword. Short term keywords are always high in search volume but ranking for those keywords is extremely tough. Whereas, long tail keywords are less competitive and easy to rank. The quality of traffic is always better for long term keywords as compared to short term keyword because the user intent is always more clear and specific which results in higher conversion rate. Start focusing on long tail keywords. If you check keywords driving traffic to your website then you will notice that more than 60% of keyword searches are long tail keywords. 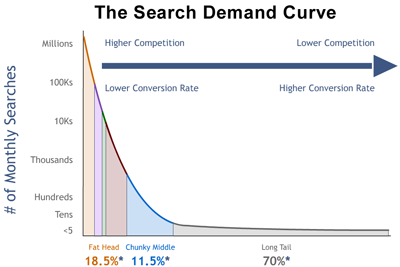 See below the search demand curve shared by lunametrics showing the competition and conversion rate comparison for short tail and long tail keywords. Finding a long tail keyword is not very tough. All you need to do is to understand the intent behind each of the keyword and select the most suitable keywords. There are many ways to figure out relevant long tail keywords which can help in driving huge traffic to your website. How to do long tail Keyword Research? Keyword research for long tail search terms is a very tricky job. You need to select few best long tail keywords for your website/article out of hundreds of keywords. There are multiple sources available which can give you long tail keywords. Find below the various long tail keyword research tools & techniques to dig out the best keywords. This is the first choice for anybody doing keyword research for their website. Google keyword planner gives you a huge list of keywords which include all types of keywords (short & long tail keywords). As you can see in the below snapshot, for query “long tail keywords” there are many long tail keywords were suggested by keyword planner tool highlighted in red boxes. Enter your keyword and combinations and download the list of keywords. Now filter out all the short tail keywords and keep only relevant long tail keywords and choose the best suitable long tail keywords for your website. 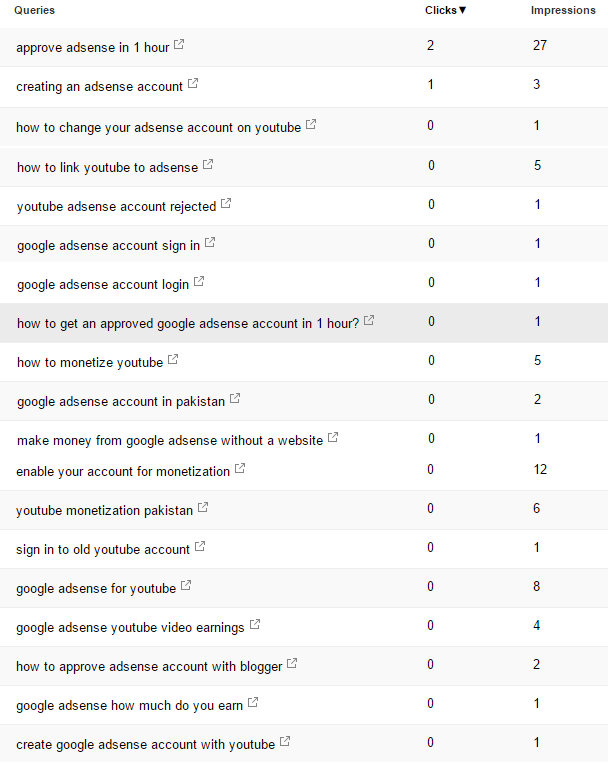 Go to search analytics and select the page level data for last 3 months. Now, select the link of the page you want to optimize and download all the keywords present. Now, sort the keywords through impressions and clicks and figure out the keywords with good search potential and start optimizing your website/article for those keywords. This section of Google search results is always ignored. It includes the keywords which actually users are searching in search engine. Check the above image where Google is showing different related searches for different search queries. Try various combinations of search queries in search engines and collect all related long tail keyword searches suggested by Google. 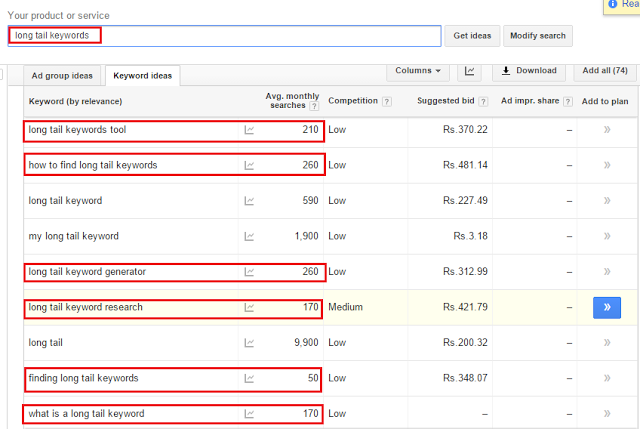 Now, filter all the long tail keywords with good search potential and start optimizing your website for those keywords. Do you want to answer questions asked directly by people? If you visit any forum or discussion board then you will notice that the kind of questions people generally ask on forums are the same they search in Google search engines. This is the reason why forums always rank better for long term keywords. See the above snapshot where the recent questions asked in yahoo answers forum. All the questions are long tail keywords and if you optimize your articles for these keywords then you can easily rank in top search results. One of the most popular platform to ask questions and getting hundreds of opinions is Quora. As you can see in above snapshot, people asking various questions in quora. 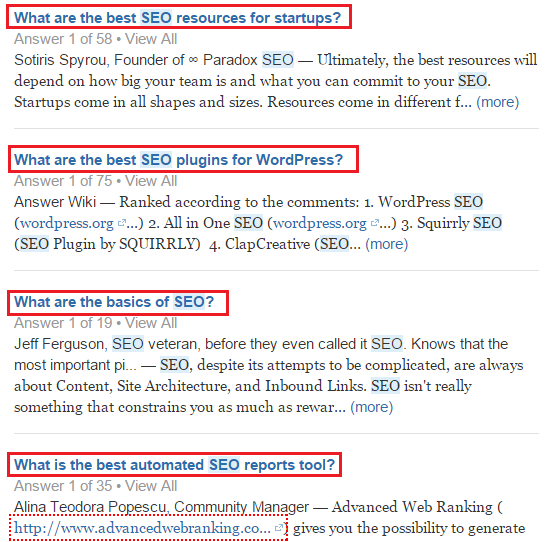 It is recommended to pick up potential long tail keywords from these questions and optimize your articles for them. UberSuggest keyword suggestion tool is very efficient tool to provide long tail keyword suggestions. Enter a keyword in search box and get various long tail keyword suggestions for the desired keyword. This is a paid keyword research tool. To find the long tail keywords thorough SEMRush, enter the keyword or domain URL in the search box and enter. It will give you all the keyword combination for a specific keyword or all the keywords for which a particular webpage URL is ranking. Enter your competitor URL in SEMRush and see the long tail keywords your competitor is ranking for. This tool will give you list of all the short & long tail keywords. All you need to do is to figure out the most relevant long tail keywords for your website. Getting traffic from high search volume keywords is a good thing but if those keywords are not converting for you then it doesn’t make sense. Long term keywords always have proper search intent which helps in converting your customers. Long term keywords are less competitive and easy to rank so optimizing website for those keywords is an easy task. Apply the above given tricks for long tail keyword research in your keyword research process and comment below if these is any query or suggestions.